Choose from a fantastic range of both new articles and proven favourites. As always we bring you an exciting cross-section of classic marketing giveaways and original gift ideas. In addition to a choice of high-quality plastic and die-cast models, farming fans both young and old will delight in the range of fashionable clothing we have on offer. We have reinterpreted a favourite parlour game: with Mow-mory farm machinery fans can now test their skill finding pairs of machines. Click on any two cards to turn them over one after the other. The objective is to find two cards with the same picture, which then disappear into the loader wagon. The game is finished once all the pairs have been found. Your score is calculated from the time you take and the number of misses. 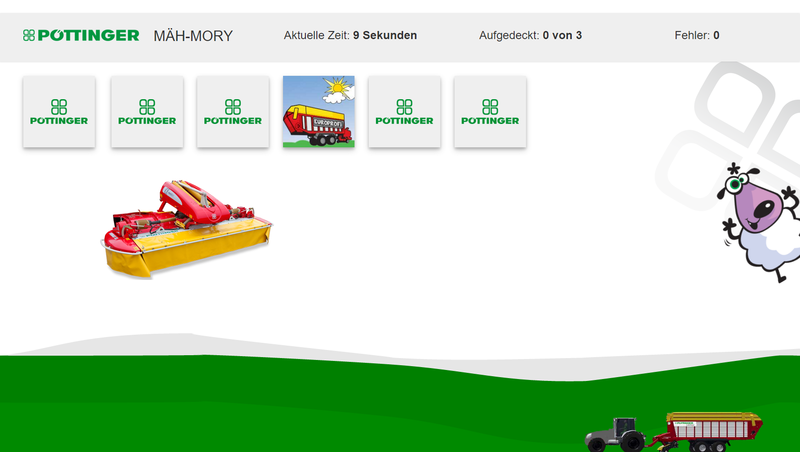 There are three different difficulty levels: a Kids Edition, a Junior Edition and a Farmer Edition. We've also added an extra challenge. How often has the mower driven past during the game? You get more bonus points for the correct answer. The best players are listed in the high score.